That old adage: it’s not what you say but the manner in which you say it, is hugely applicable to this hilarious book for emerging readers. 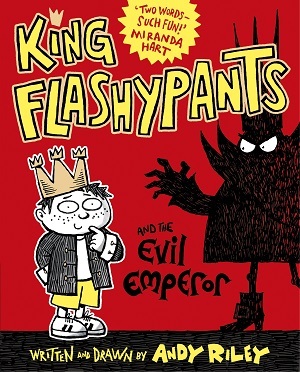 The story of King Flashypants and the Evil Emperor Nurbison in the kingdom next door, borrows a general plot from almost every story in the world – will good triumph over evil? But the freshness, pizzazz, and hilarity of its execution is what makes this title a top read for the age group (and their parents). Andy Riley excels in his easy-to-read text that speaks directly to the reader, setting the tone from the contents page, which is called ‘The Names of all the thrilling chapters you’re about to read’. His tongue-in-cheek style is consistent throughout, from observations about how much children need chocolate (like air), to his explanations of what makes a castle good as opposed to evil. King Flashypants, or Edwin, as our nine year old protagonist is called, is depicted nonchalantly reclining on his throne, important crown on head, drink with straw in his hand. He’s completely loveable, and understandably for a nine-year-old, has slightly let his power go to his head. So, when he runs out of money, having spent it all on chocolate that he generously gives out to his subjects, his kingdom faces enormous trouble. Resonating slightly with today’s economic deficit, this is a hilarious take on the perils of governing unwisely. Illustrations punctuate each page, and add to the story rather than just annotate it. Things to particularly note are the map at the beginning, the gallery of portraits, the wonderful hand expressions – Riley’s characters express from their head to their toes – the eclectic collection of peasants (the description of them is hysterical), and the drawing of Edwin’s chocolate-dispensing contraption. From creating a new evil laugh to bottomless pits, the excellent variety of villainous friends, and a particularly vocal peasant girl called Natasha, there is lots to admire here. The plot is brilliantly stupid, which simply serves to further highlight the comedy, and the ending, where the characters discuss what they have learned ‘a la primary school practice circle time’, borders on comedy genius. The funniest and most enjoyable book for this age group for quite some time. I even sang the song at the end. And apparently more to come in the series. I can’t wait. Age 6+ years, you can buy a little piece of King Flashypants’ kingdom here.